Pièce1991.028 item 146 - Caledon East. Ont. Pièce1991.028 item 147 - G.T.R. Station, Caledon East, Canada. Pièce1991.028 item 149 - English Ch. Caledon East Ont. Pièce1991.028 item 150 - Methodist Church, Caledon East, Ont. Pièce1991.028 item 151 - Methodist Church, Caledon, Ont. Pièce1991.028 item 152 - Main Street, Caledon, Ont. Pièce1991.028 item 155 - A Scene at ALTON, Ont. Pièce 1991.028 item 151 - Methodist Church, Caledon, Ont. 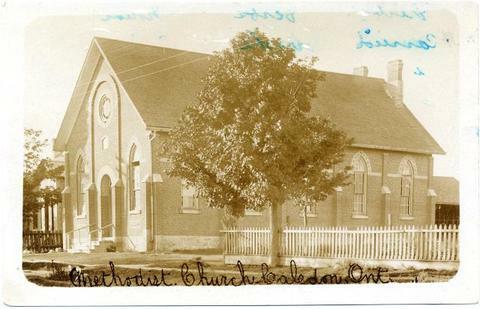 Anglais » Methodist Church, Caledon, Ont.